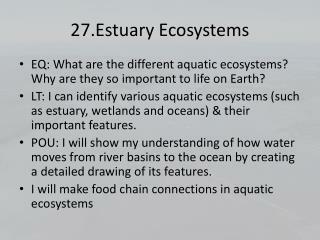 Explainwhy an estuary is a very productive ecosystem. 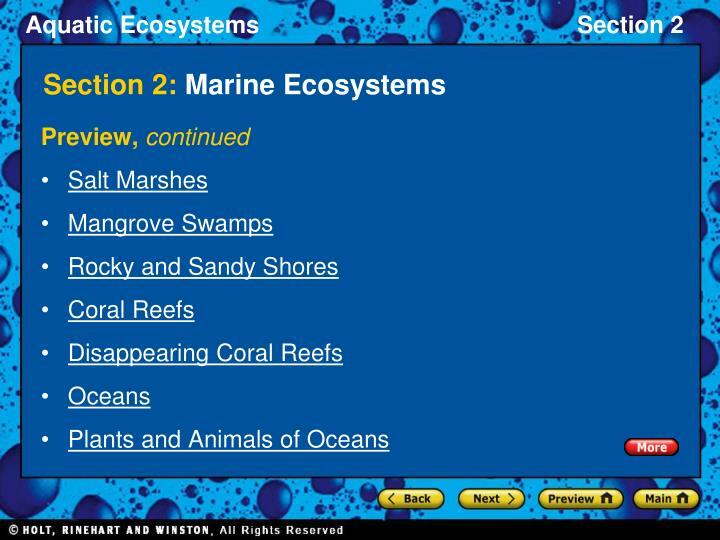 Comparesalt marshes and mangrove swamps. 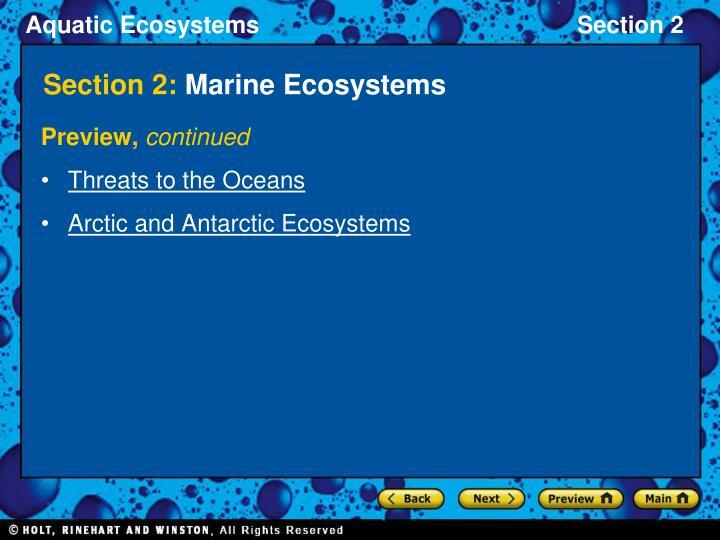 Describetwo threats to coral reefs. 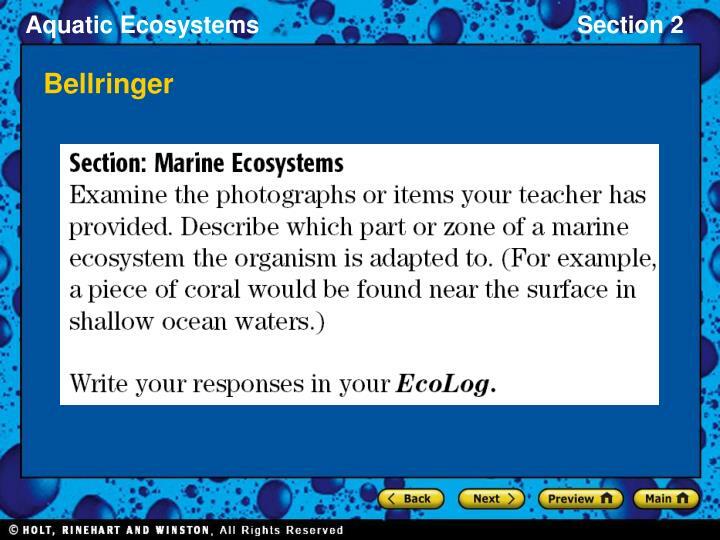 Describetwo threats to ocean organisms. 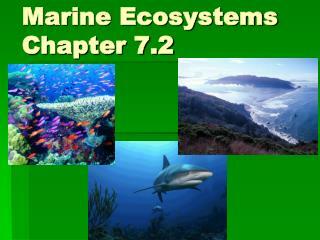 Marine ecosystems are located mainly in coastal areas and in the open ocean. 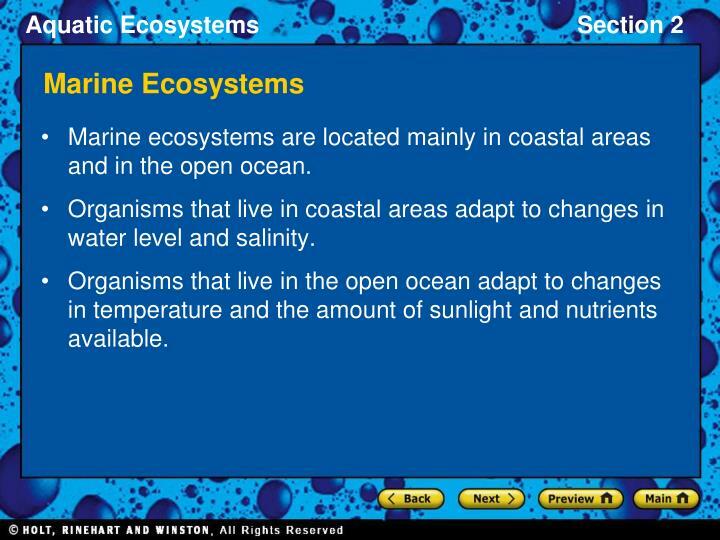 Organisms that live in coastal areas adapt to changes in water level and salinity. 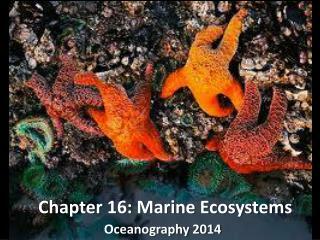 Organisms that live in the open ocean adapt to changes in temperature and the amount of sunlight and nutrients available. 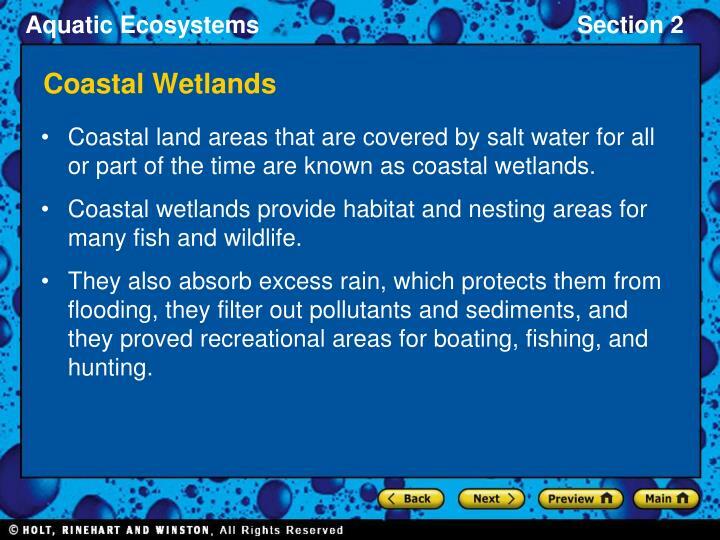 Coastal land areas that are covered by salt water for all or part of the time are known as coastal wetlands. 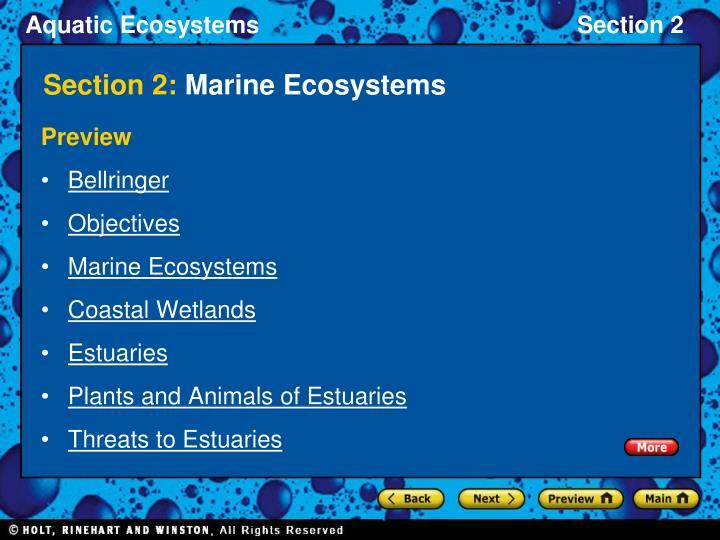 Coastal wetlands provide habitat and nesting areas for many fish and wildlife. 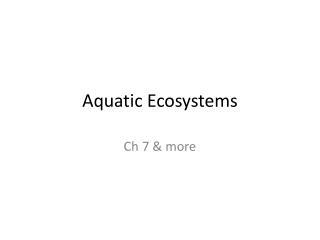 They also absorb excess rain, which protects them from flooding, they filter out pollutants and sediments, and they proved recreational areas for boating, fishing, and hunting. 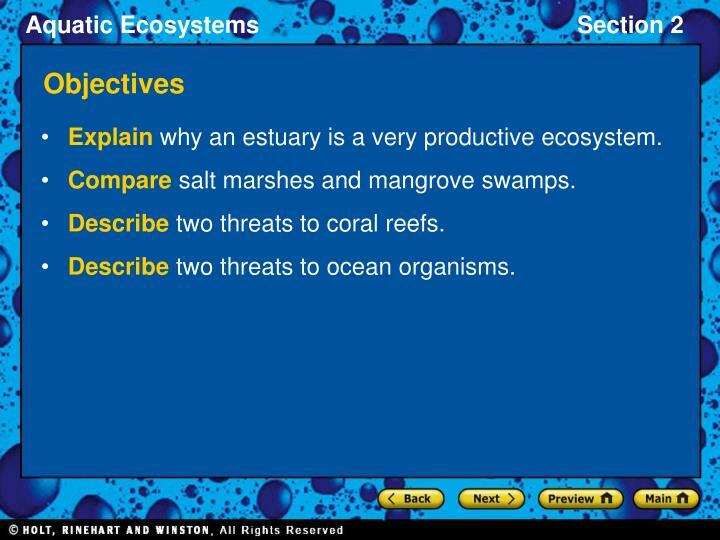 An estuary is an area where fresh water from rivers mixes with salt water from the ocean. As the two bodies meet, currents form and cause mineral rich mud with many nutrients to fall to the bottom making in available to producers. 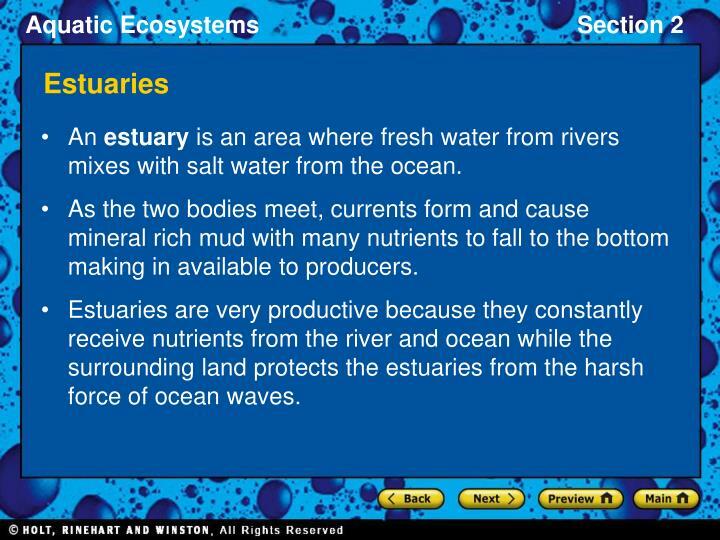 Estuaries are very productive because they constantly receive nutrients from the river and ocean while the surrounding land protects the estuaries from the harsh force of ocean waves. 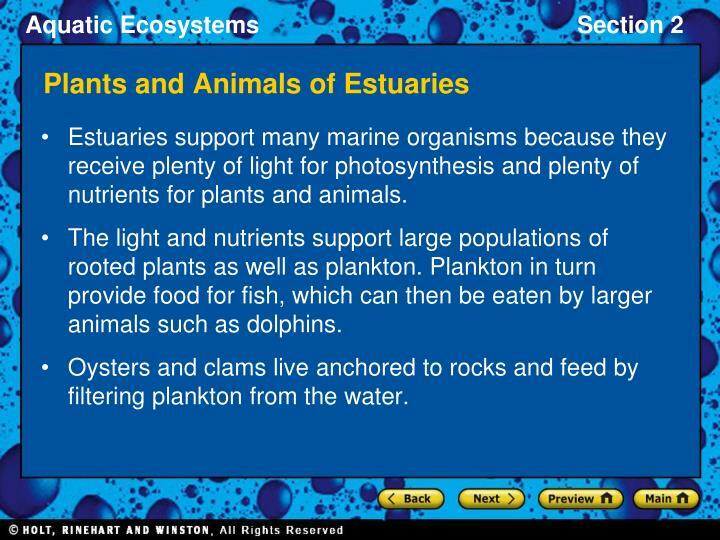 Estuaries support many marine organisms because they receive plenty of light for photosynthesis and plenty of nutrients for plants and animals. 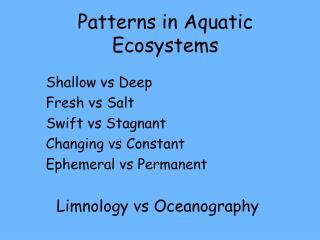 The light and nutrients support large populations of rooted plants as well as plankton. Plankton in turn provide food for fish, which can then be eaten by larger animals such as dolphins. Oysters and clams live anchored to rocks and feed by filtering plankton from the water. 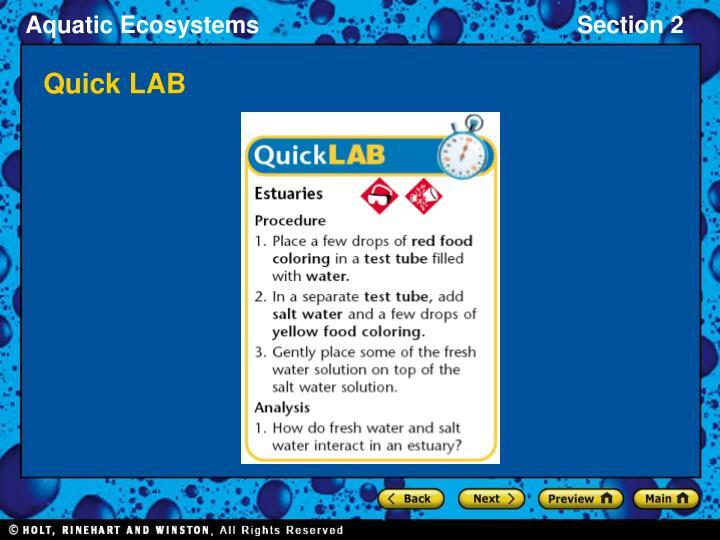 Organisms that live in estuaries are able to tolerate variations in salinity because the salt content of the water varies as fresh water and sat water mix when tides go in and out. Estuaries also proved protected harbors, access to the ocean, and connection to rivers. 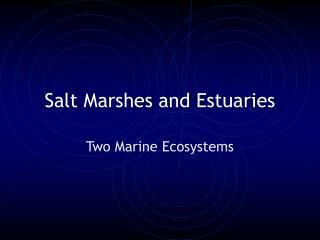 As a result, many of the largest ports have been built on estuaries. 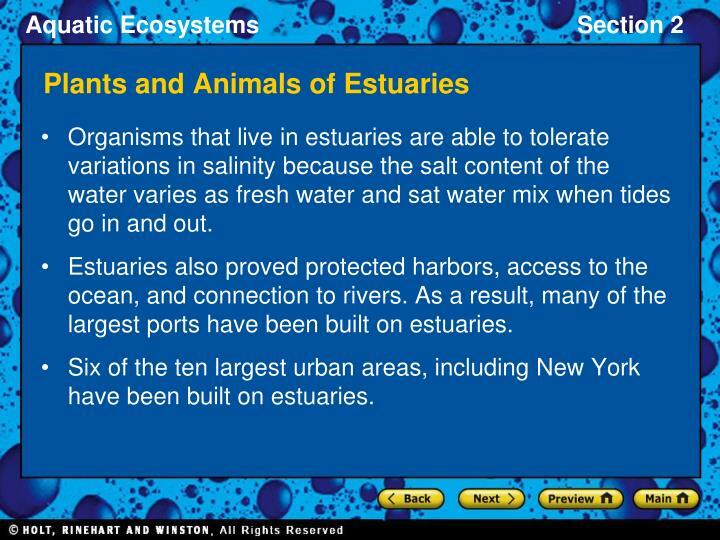 Six of the ten largest urban areas, including New York have been built on estuaries. 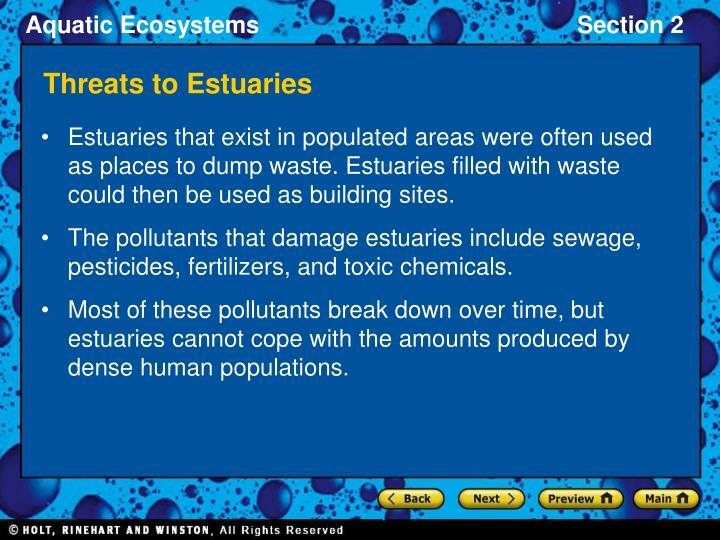 Estuaries that exist in populated areas were often used as places to dump waste. Estuaries filled with waste could then be used as building sites. 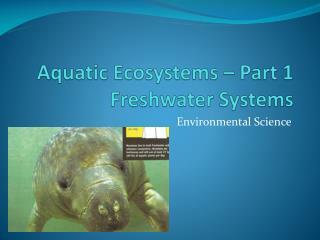 The pollutants that damage estuaries include sewage, pesticides, fertilizers, and toxic chemicals. 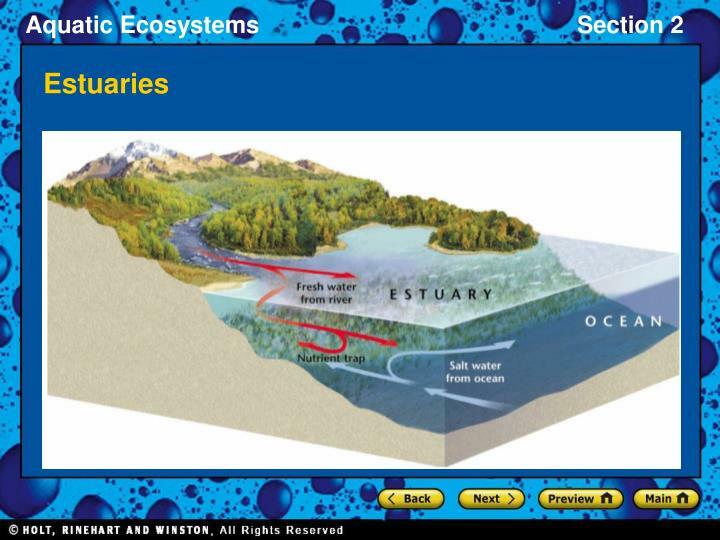 Most of these pollutants break down over time, but estuaries cannot cope with the amounts produced by dense human populations. Salt marshes are maritime habitats characterized by grasses, sedges, and other plants that have adapted to continual, periodic flooding and are found primarily throughout the temperate and subarctic regions. 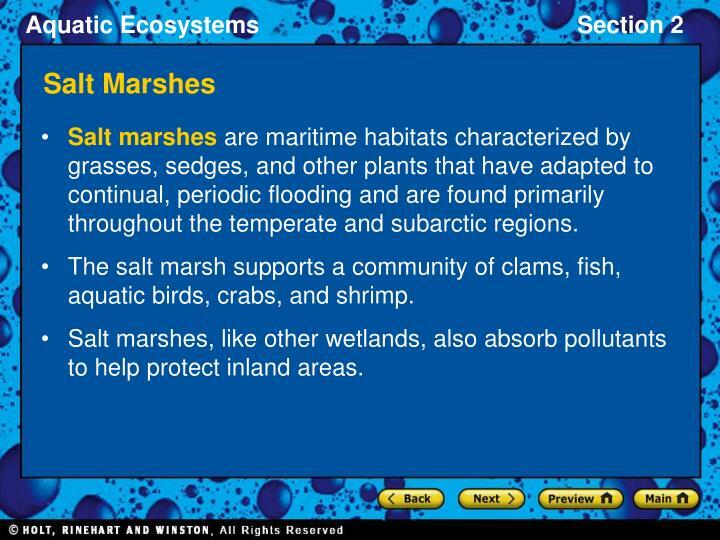 The salt marsh supports a community of clams, fish, aquatic birds, crabs, and shrimp. Salt marshes, like other wetlands, also absorb pollutants to help protect inland areas. Mangrove swampsare tropical or subtropical marine swamps that are characterized by the abundance of low to tall mangrove trees. 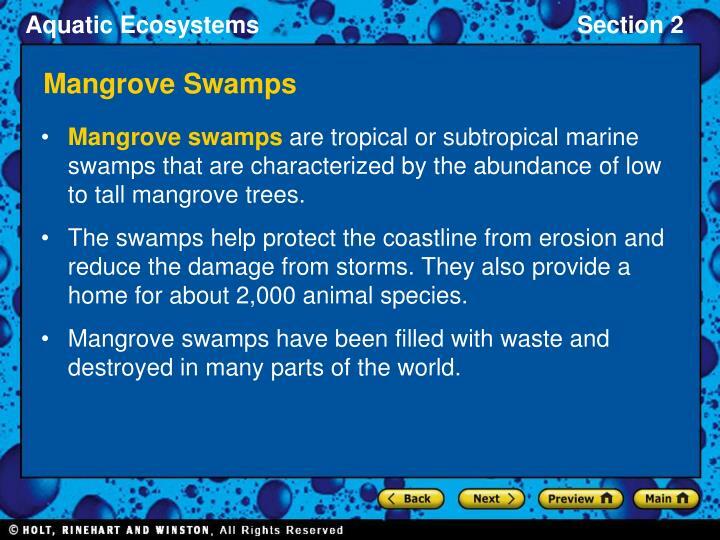 The swamps help protect the coastline from erosion and reduce the damage from storms. 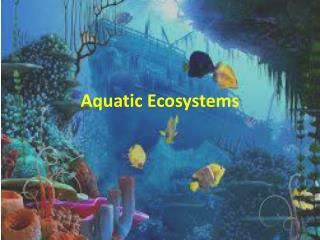 They also provide a home for about 2,000 animal species. Mangrove swamps have been filled with waste and destroyed in many parts of the world. 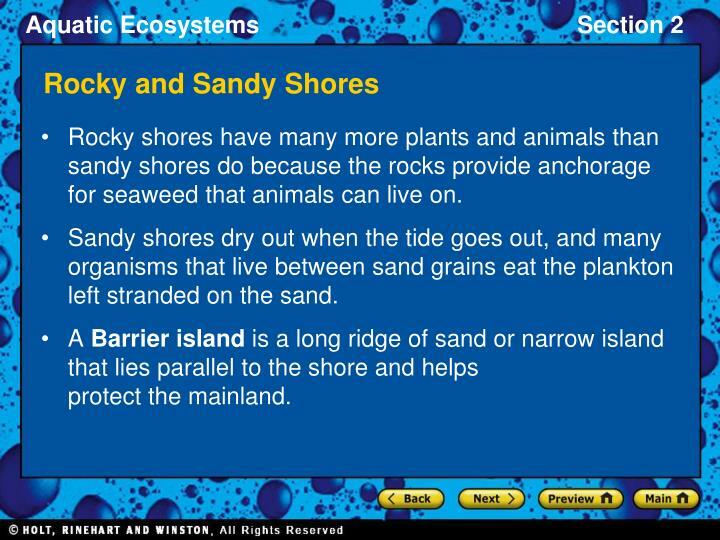 Rocky shores have many more plants and animals than sandy shores do because the rocks provide anchorage for seaweed that animals can live on. Sandy shores dry out when the tide goes out, and many organisms that live between sand grains eat the plankton left stranded on the sand. A Barrier island is a long ridge of sand or narrow island that lies parallel to the shore and helps protect the mainland. 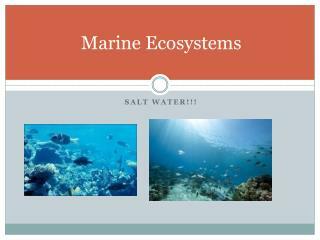 Coral reefsare limestone ridges found in tropical climates and composed of coral fragments that are deposited around organic remains. 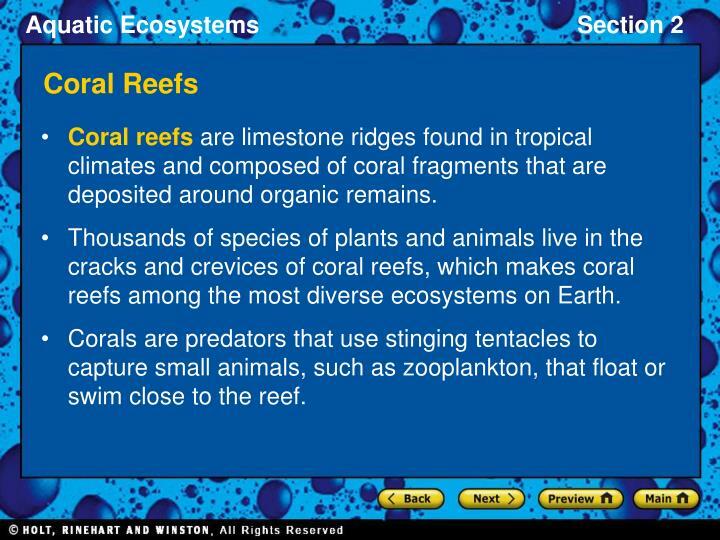 Thousands of species of plants and animals live in the cracks and crevices of coral reefs, which makes coral reefs among the most diverse ecosystems on Earth. Corals are predators that use stinging tentacles to capture small animals, such as zooplankton, that float or swim close to the reef. 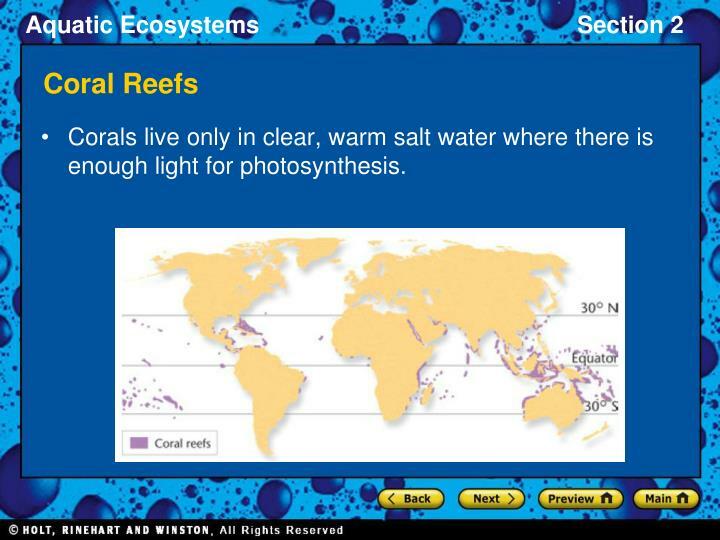 Corals live only in clear, warm salt water where there is enough light for photosynthesis. 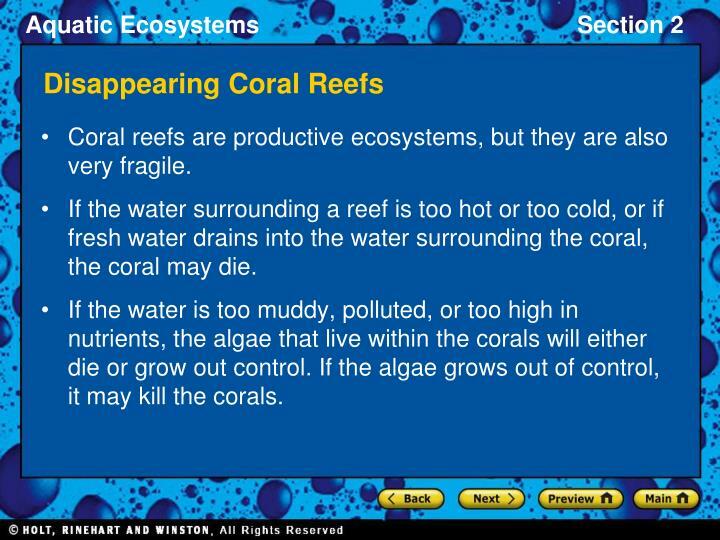 Coral reefs are productive ecosystems, but they are also very fragile. If the water surrounding a reef is too hot or too cold, or if fresh water drains into the water surrounding the coral, the coral may die. If the water is too muddy, polluted, or too high in nutrients, the algae that live within the corals will either die or grow out control. 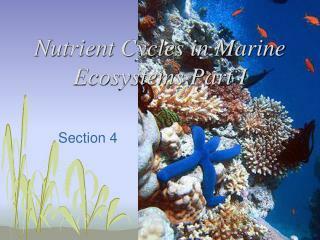 If the algae grows out of control, it may kill the corals. 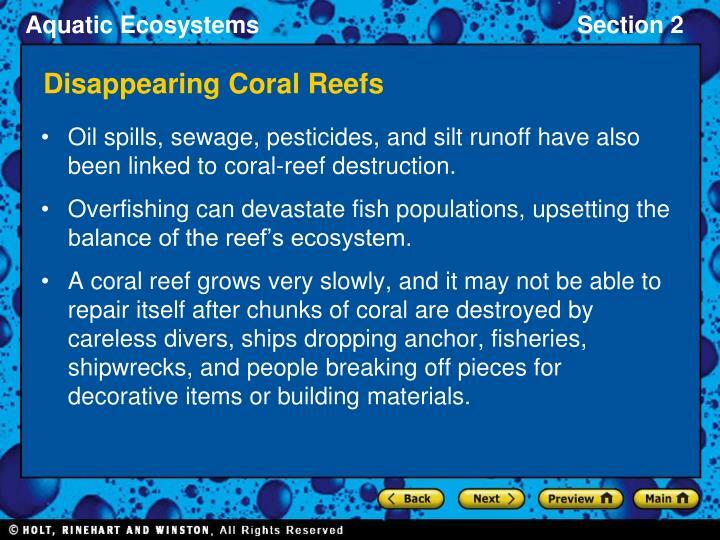 Oil spills, sewage, pesticides, and silt runoff have also been linked to coral-reef destruction. Overfishing can devastate fish populations, upsetting the balance of the reef’s ecosystem. A coral reef grows very slowly, and it may not be able to repair itself after chunks of coral are destroyed by careless divers, ships dropping anchor, fisheries, shipwrecks, and people breaking off pieces for decorative items or building materials. 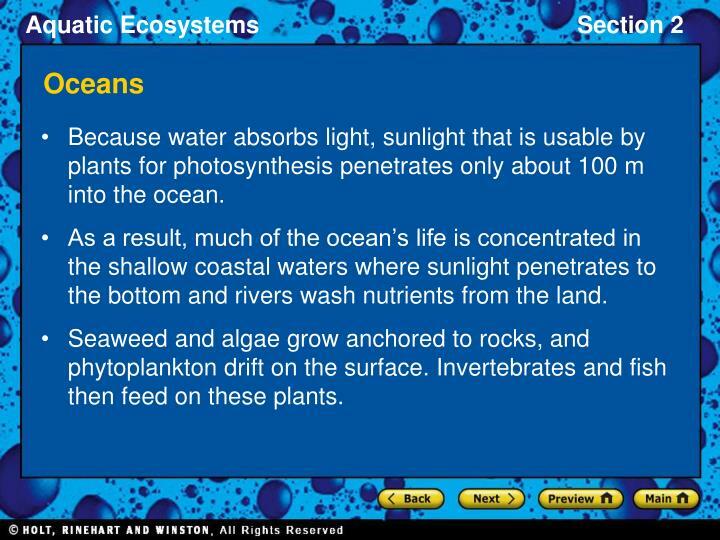 Because water absorbs light, sunlight that is usable by plants for photosynthesis penetrates only about 100 m into the ocean. 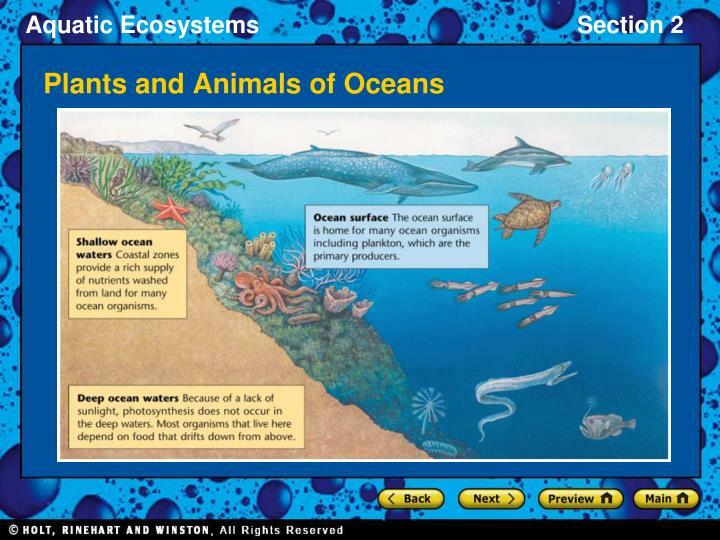 As a result, much of the ocean’s life is concentrated in the shallow coastal waters where sunlight penetrates to the bottom and rivers wash nutrients from the land. 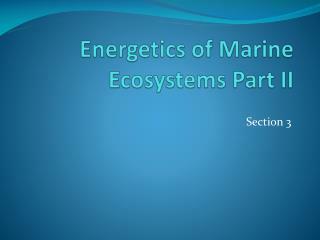 Seaweed and algae grow anchored to rocks, and phytoplankton drift on the surface. 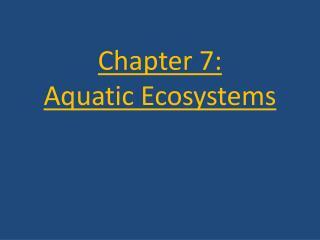 Invertebrates and fish then feed on these plants. 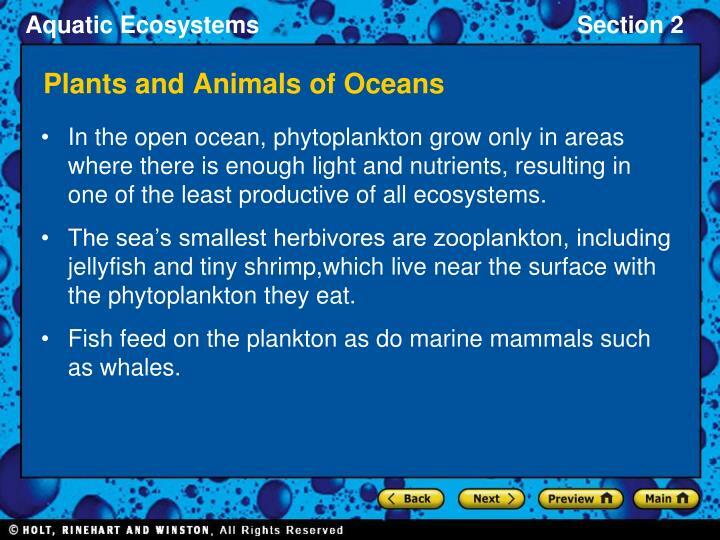 In the open ocean, phytoplankton grow only in areas where there is enough light and nutrients, resulting in one of the least productive of all ecosystems. The sea’s smallest herbivores are zooplankton, including jellyfish and tiny shrimp,which live near the surface with the phytoplankton they eat. 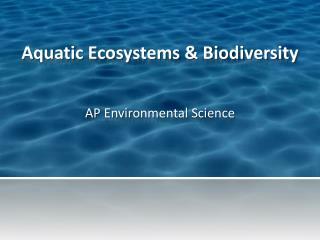 Fish feed on the plankton as do marine mammals such as whales. The depths of the ocean are very dark, so most food at the ocean floor consists of dead organisms that fall from the surface. 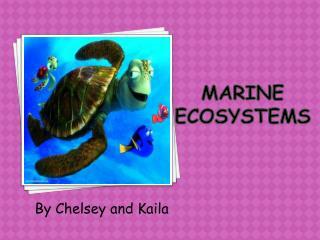 Decomposers, filter feeders, and the organisms that eat them live in the deep areas of the ocean. 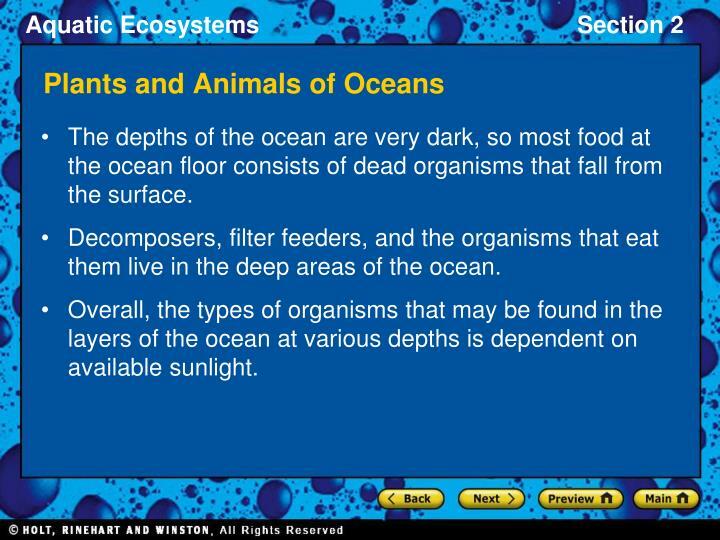 Overall, the types of organisms that may be found in the layers of the ocean at various depths is dependent on available sunlight. 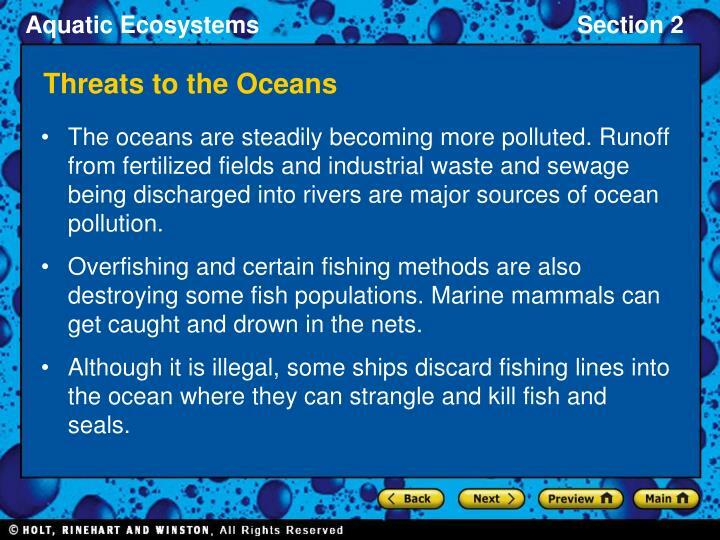 The oceans are steadily becoming more polluted. 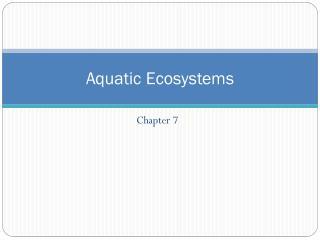 Runoff from fertilized fields and industrial waste and sewage being discharged into rivers are major sources of ocean pollution. 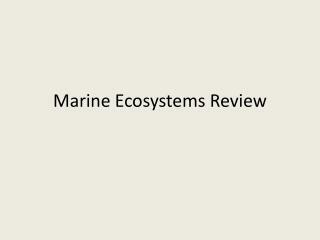 Overfishing and certain fishing methods are also destroying some fish populations. Marine mammals can get caught and drown in the nets. Although it is illegal, some ships discard fishing lines into the ocean where they can strangle and kill fish and seals. 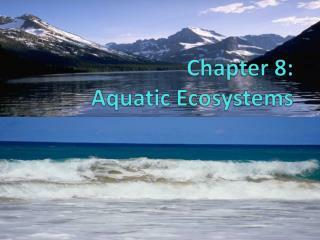 The Arctic Ocean is rich in nutrients from the surrounding landmasses and supports large populations of plankton, which feed a diversity of fish in the open water and under the ice. These fish are food for ocean birds, whales The arctic ecosystems at the North and South Poles depend on marine ecosystems because nearly all the food comes from the ocean. and seals. 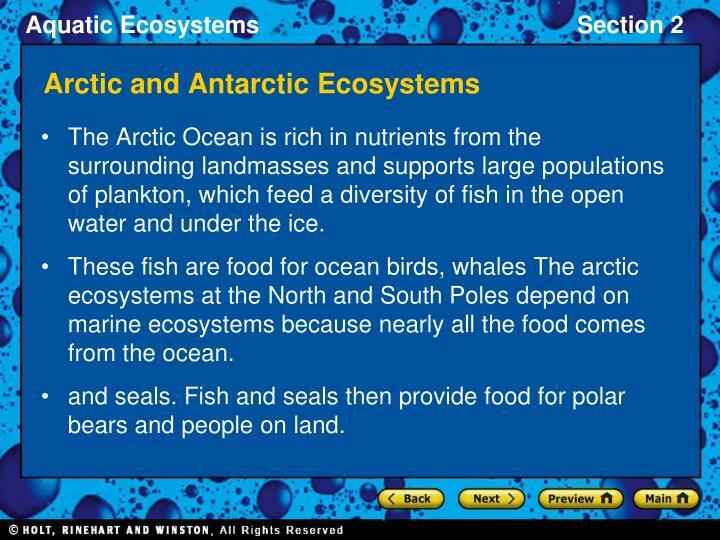 Fish and seals then provide food for polar bears and people on land. The Antarctic is the only continent never colonized by humans. 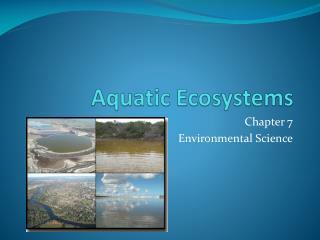 It is governed by an international commission and is used mainly for research. Even during the summer, only a few plants grow at the edges of the continent. 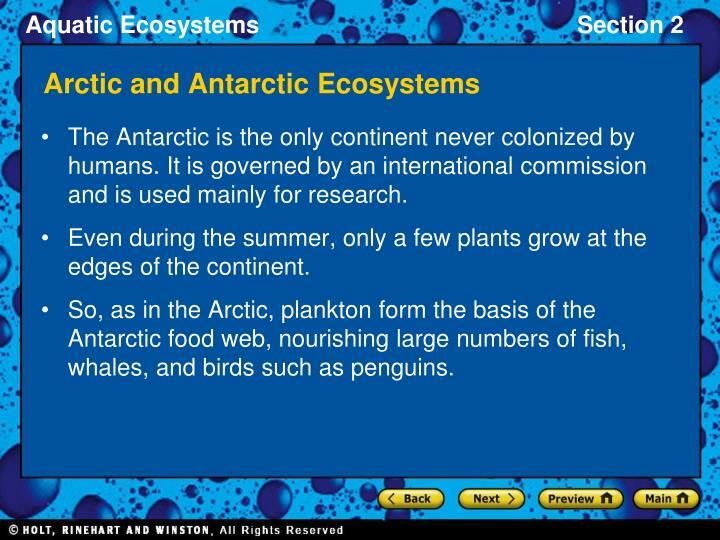 So, as in the Arctic, plankton form the basis of the Antarctic food web, nourishing large numbers of fish, whales, and birds such as penguins. 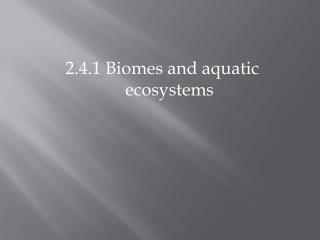 2.4.1 Biomes and aquatic ecosystems -. 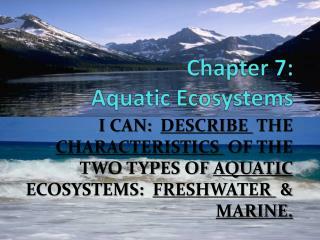 major ecosystems of the world. 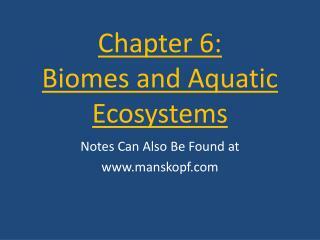 biomes. 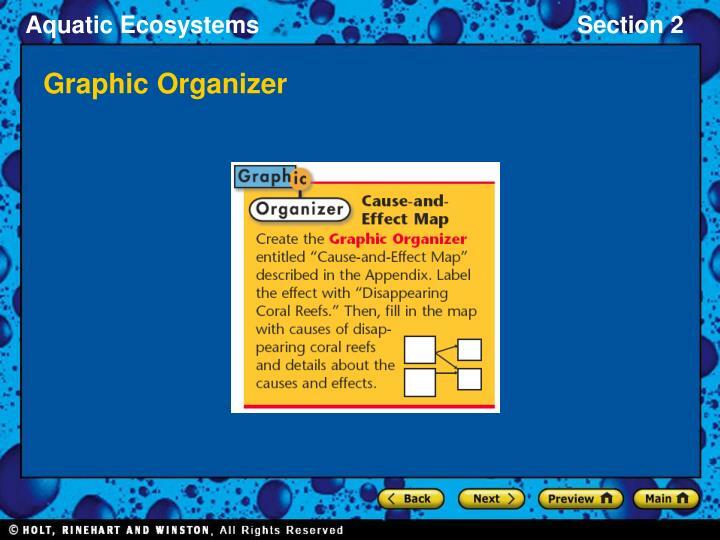 biomes of the world. 1. the tundra. 1. extremely cold climate. 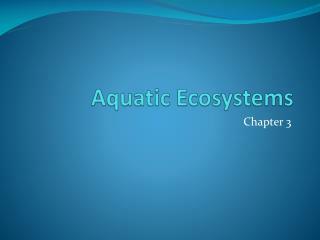 2. low biotic diversity. 3. simple vegetation structure. 4. permafrost  limited drainage. 5.